Hey guys, you may or may not know that FM Scout has received an unfortunate injury which has lead to the loss of all data recorded since 31st October. This means that I have abondoned my Liverpool story, unfortunately, but I will start another story with my beloved KuPS. I loved my last story with them and I hope to re-create my success with this story. Good luck Rookie!!! I hope for great things from you. 2012-11-28 00:10#69459 Kiwi : Good luck Rookie!!! I hope for great things from you. A fruit is talking to me? I didn't know you followed it last time! Somebody would think that you wished me luck twice to get more posts to climb the ranks! Funny, I never heard of Manchester! 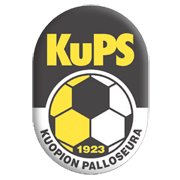 Kuopion Palloseura (or KuPS) is a Finnish football club, based in the 8th most populated city of Finland, Kuopio. KuPS plays in Finland's Premier League, Veikkausliiga. The team plays its home matches at Savon Sanomat Areena. Until June 2005, KuPS used to play at an aged track and field stadium in Väinölänniemi, which is said to be one of the most beautiful sporting places in Finland. Väinölänniemi is a cape surrounded by a local lake, Kallavesi. KuPS holds the Finnish club record of the most consecutive seasons in the top flight, from 1949 to 1992. The team is placed fourth in the all-time Finnish premier league honour table. KuPS was founded in 1923 and holds 4th place in the all-time table of the Finnish Premier League (called Veikkausliiga since 1991). KuPS have played in the top flight for 50 seasons and claimed five league titles, two Finnish Cup titles and one Finnish League Cup title. In addition to that KuPS have finished as runners-up in the league nine times and claimed numerous junior titles. Winners (5): 1956, 1958, 1966, 1974, 1976. Runners-up (9): 1950, 1954, 1964, 1967, 1969, 1975, 1977, 1979, 2010. Winners (3): 2000, 2004, 2007. Hmmmm, I am not sure how my wife would feel about you calling me a fruit?? What are you trying to say there Rook?? Bumpety bump bump for epic to-be story. 2012-11-28 18:20#69668 Kiwi : Hmmmm, I am not sure how my wife would feel about you calling me a fruit?? What are you trying to say there Rook?? 2012-11-28 19:41#69698 Atreidas : Bumpety bump bump for epic to-be story. You are reading "KuPS - The Rocky Road To Glory".